For a ceremony that celebrates the purity and sanctimony of marriage, while retaining the beauty and splendour of the occasion, the Drape Mandap provides crisp, pure, white drapes, bowing down in perfect symmetry to offer a luxurious coverage balanced in colour by an exciting blend in floral arrangements. The Drape Mandap allows beauty and decadence to shine through without leaving attendees feeling too overwhelmed; this mandap is certainly one of our most understated. The wedding mandaps are laid out with a series of white-and-gold chairs and stools, with ornamental touches in symmetry around the drapes. 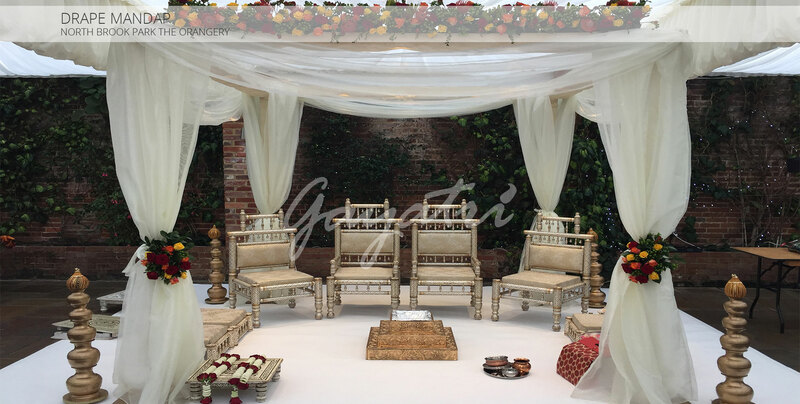 The Drape Mandap and furniture offer a splendid but blank canvas to which a ceremony can paint over; allowing a wedding to flourish without fear of decoration overshadowing the day. Despite this, the Drape Mandap offers an inspiring and memorable look, making the ceremony all the more memorable for all in attendance, retaining traditional Indian decoration throughout.